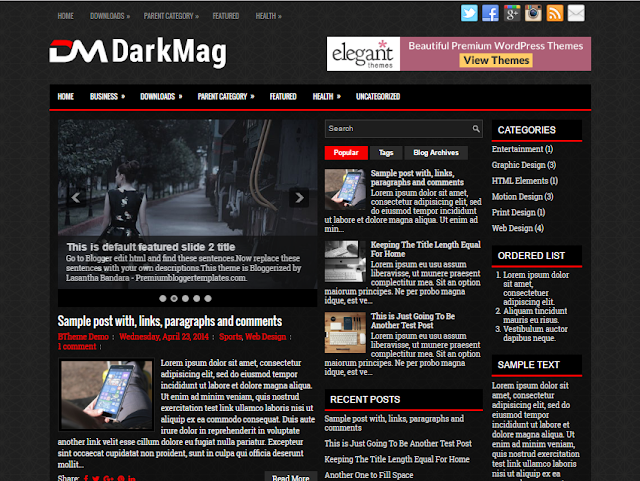 DarkMag is a Dark, Responsive, 3 Columns Blogger Template with a 3 Coulmns Footer. DarkMag Blogger Template has a Featured Post Slider, 2 Dropdown Menus, Header Banner Widget, Related Posts, Breadcrumb, Social and Share Buttons, 2 Right Sidebars, Google Fonts, Tabbed Widget and More Features. 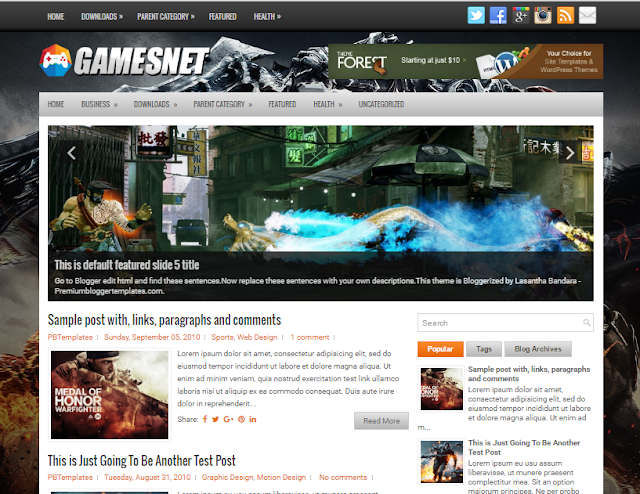 GamesNet is a free blogger template with features such as 1 Sidebar, 2 Columns, 3 Columns Footer, Adapted from WordPress, Black, Breadcrumb, Elegant, Featured Section, Fixed width, Responsive, Games, Grey, jQuery Included, Header Banner, HTML5/CSS3, Magazine, Mobile Friendly, Orange, Premium, Related Posts with Thumbnails, Right Sidebar, Slider, Share Buttons, Social Buttons, Tabbed widget, Top Navigation Menu, Web 2.0, White. 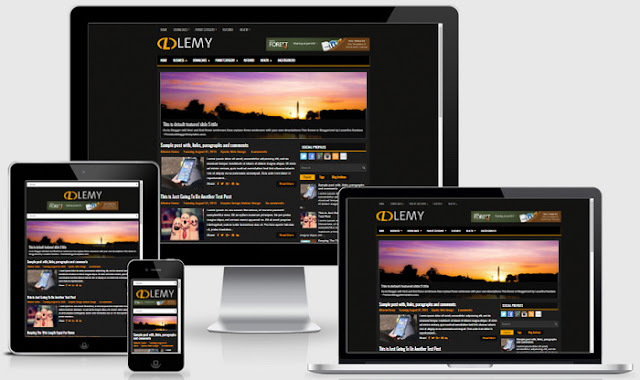 Lemy is a free blogger template with features such as 1 Sidebar, 2 Columns, 3 Columns Footer, Adapted from WordPress, Black, Breadcrumb, Elegant, Featured Section, Fixed width, Responsive, jQuery Included, Header Banner, HTML5, CSS3, Magazine, Mobile Friendly, Premium, Related Posts with Thumbnails, Right Sidebar, Slider, Share Buttons, Social Buttons, Tabbed widget, Top Navigation Menu, Web 2.0, Yellow. 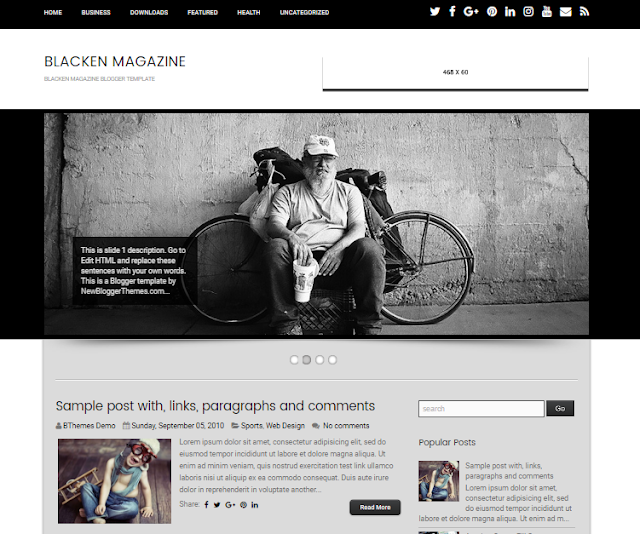 Blacken Magazine is a clean and minimal, dark color, 2 columns blogger template for personal blogs. 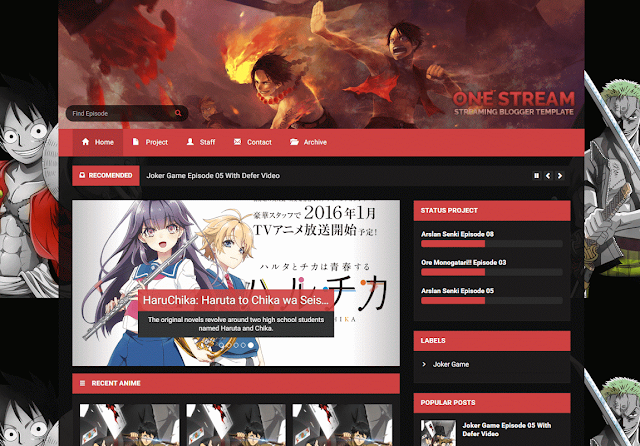 Blacken Magazine blogger template has a right sidebar, 4 columns footer widgets area, top main navigation with social buttons, slider, related posts with thumbnails, share icons, auto post summaries, Google web fonts and more. 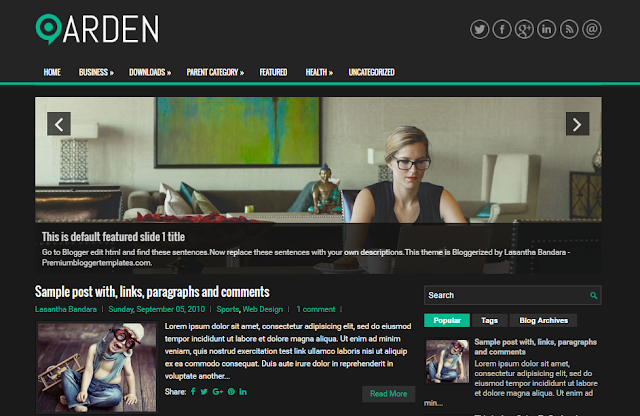 Arden is a free blogger template with features such as 1 Sidebar, 2 Columns, 3 Columns Footer, Adapted from WordPress, Black, Breadcrumb, Elegant, Featured Section, Fixed width, Responsive, Green, jQuery Included, Header Banner, HTML5, Magazine, Mobile Friendly, Premium, Related Posts with Thumbnails, Right Sidebar, Search Engine Friendly, Slider, Share Buttons, Social Buttons, Tabbed widget, Top Navigation Menu, Web 2.0. TheCars is a Responsive, 3 Columns Blogger Template for Auto Blogs. TheCars Blogger Template has Left and Right Sidebars, jQuery Slider, 2 Top Navigation Menus, Header Search Box, Related Posts with Thumbnails, Breadcrumb, 3 Columns Footer, Tabbed Widget and More Features.